A present from the town of Richmond for her 1893 wedding to the future King George V, Queen Mary's Richmond Brooch is a large piece made from diamonds set in silver and gold in a scrolling design surrounding a central pearl, with a pearl and diamond pendant hanging below. 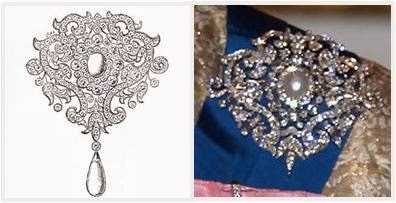 It's a flexible jewel - the central pearl and pearl pendant are detachable (Mary, as we know, was prone to switching around her jewels, and accordingly this pendant was once used in the Cambridge Lover's Knot Tiara), more pendants can be added, the whole brooch can be used as a pendant itself, and Queen Mary even used it in her hair. The brooch has been identified by several different names over the years. In the original edition of Leslie Field's The Queen's Jewels, it was identified as the Warwick Sun Brooch, a present from the Earl of Warwick and family; in a later edition, it was called the Surrey Brooch, a present from the Ladies of Surrey Needlework Guild. Hugh Roberts' The Queen's Diamonds has now corrected this to be the brooch from Richmond. 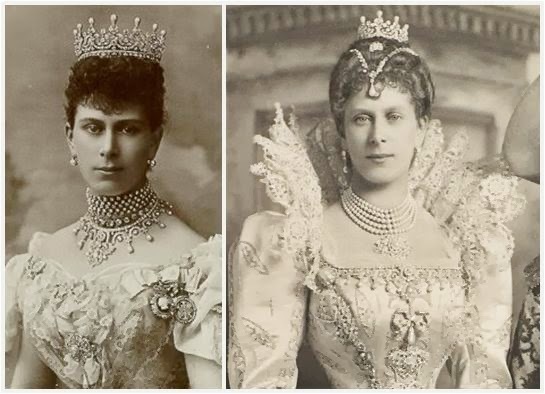 These were all wedding gifts to the then-Princess Victoria Mary of Teck; since the bride's gifts included upwards of 40 brooches, it's not surprising that some confusion has resulted. The Queen inherited the brooch when Queen Mary died, in 1953. She wore it during her post-Coronation Commonwealth tour but then seems to have put it away. Only in her later years has it appeared again, worn for evening events and a few special day engagements. She has worn it both with and without the bottom pearl pendant.